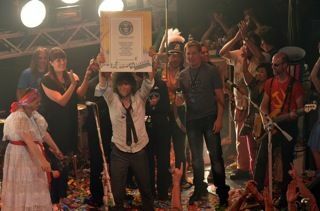 From June 27 to June 28, 2012, the band The Flaming Lips performed the most shows in a 24-hour time frame, winning the Guinness World Record. They visited eight cities, starting in Memphis, TN, and ending in New Orleans, LA. At each venue, the band performed alongside other bands and musicians, such as Neon Indian, Jackson Brown, and Grace Potter & the Nocturnals. The Flaming Lips lead singer and guitarist Wayne Coyne holds up the Guinness World Record certificate onstage. While traveling in Elvis’ last tour bus, the band was joined by other bands and stars, such as Neon Trees and actor Chris Pontius. Together, this motley crew handed out awards for the MTV 24-hour Online Music Awards. On top of breaking the Guinness World Record, The Flaming Lips teamed up with MTV to live stream the concerts, and traveling from venue to venue using the webcast production suite TriCaster. Nicknamed the "TV truck in a box", NewTek Inc.’s TriCaster offers audiences HD-quality videos, and is easily accessible for its users. It offers third-party router support, recordable macros that can be triggered simultaneously, has extensive effects and graphic capabilities.NewTek representatives explain that the TriCaster is popular with broadcasters, producers, bloggers, agencies, et cetera, because it creates a more personal bond with audiences, and helps generate new revenue opportunities. By using the TriCaster, O Music Awards reached fans unable to make the shows, as well as, generate new fans in new demographic regions. People were able to access The Flaming Lips concerts and all the fanfare of the event on their televisions and web and mobile devices. Wayne Coyne and Grace Potter onstage. Social networks were not left out of the loop, either. TriCaster makes it possible for live footage to be immediately distributed to sites such as Facebook, YouTube, and Twitter. This makes it much easier for computer users to watch live concerts, as well as, engage with other fans in real time. A physical world record was broken in June, but could this event also mark a bellwether for virtual entertainment possibilities? As more commercial tech managers and AV rental professionals stream live concerts, consumer expectations will continue to evolve. Fans will no longer miss out on seeing their favorite bands due to location or costs, and they will not be short-changed on audio or video quality. Ashley Blume is a writer and editor based in Syracuse, New York. She is a graduate of SUNY Geneseo.